Apparel available for ordering. Click links below. May be picked up at the Clerk School in February. For questions or additional information, please contact Eddie Moore (listed above). 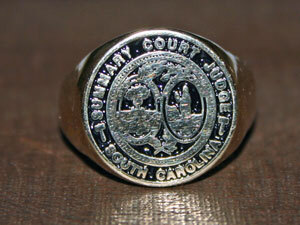 Please view the below link for SCSCJA rings, watches and other jewelry made exclusively for judges. These rings are made only by Kenneth Carr. Kenneth can also use your old or broken gold to off set costs.